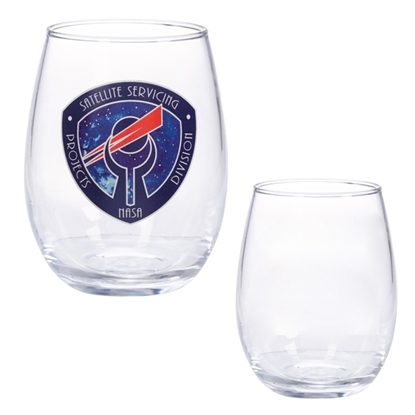 Make your brand seen with every sip from this beautiful wine glass! It's made of the highest standard material and made in the USA. This clear item measures 4" and can hold up to 9 oz. This is perfect for restaurants, bars, and can even be used at home for dinner parties or other events. Add your company name or logo to this for a broader awareness of your business. Your customers will love walking away from you with this in their hands! Clients can get a firm grasp on your brand when you add it to this 15 oz. Wine Glass! Made in the USA from highest standard glass material, it's perfect for restaurants, bars and more. This glass features a clear goose egg glass design, a large stemless version with a brim. Add a customized imprint of your company's name, logo or marketing message before you place it into the hands of your favorite customers while they celebrate or relax at your establishment! 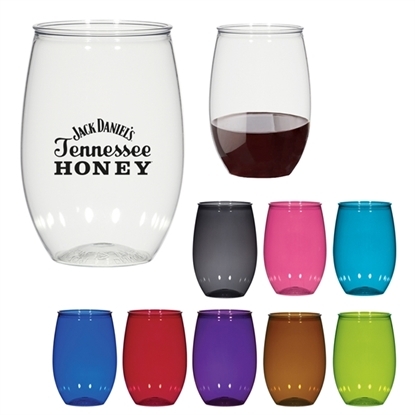 Get customers excited about what you have to offer when you give them this beautiful stemless wine glass! It measures 4 1/2" tall, holds up to 16 oz. of liquid, and is made in the USA of BPA-free PET material. This meets FDA requirements and a hand wash is recommended for care. Silkscreen this with your company logo and make this a giveaway at tastings or what you use to serve clients at special events! Juice up your barware to reflect your brand in a unique way with this 5.5 Oz. Wine Glass! Made in the USA from the highest standard glass material, it's perfect for restaurants, bars and more. It has a clear, large stemless design like a goose egg and a brim. 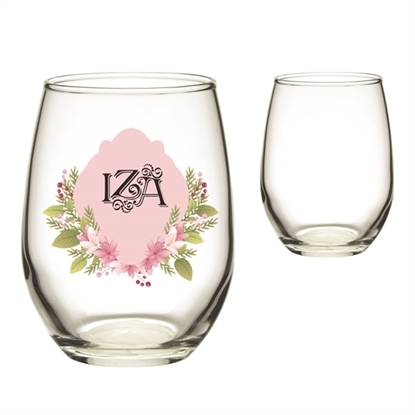 Simply add your company's name, logo and marketing message before placing this glass in the hands of your customers who want to celebrate or relax in your establishment! 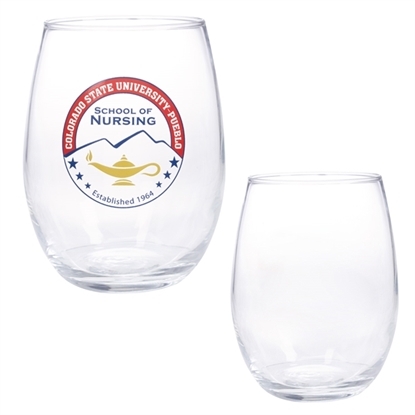 Get more people to notice your brand with this wine glass as a part of your next promotion! It's made of a higher standard material and made in the USA, so you can count on its quality. This measures 8" tall and holds up to 10 oz. of your favorite red or white. This would make a great addition to any restaurant or bar. Add an imprint of your company name or logo and serve your customers or dinner party guests in something spectacular! Ask yourself "wine not?" during the next promotional campaign! This 19 oz. tall wine glass features a rounded design and a chip-resistant rolled rim, and it has a long, sturdy stem and a wide base. What an ideal item for bars and restaurants and a perfect addition to any dining room set! Customize with an imprint of your brand logo and your company will be sipping to success in no time! 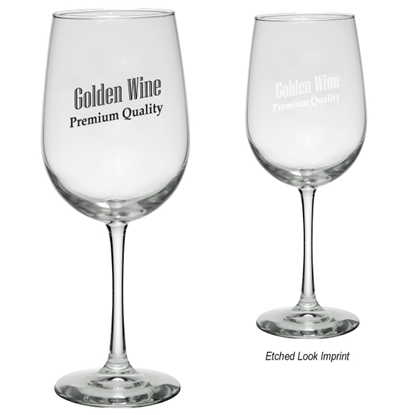 Mypromotionalpens.com offers the largest and best priced selection in Promotional Wine Glasses. We will price compete and we won't be under sold. Let our graphic designers make your personalized Wine Glasses standout above the crowd at no charge. We won't stop until you are completely satisfied with your custom Wine Glasses art proof.Use category search filters on your left to help narrow your search to find exactly what you are looking for.